Sabarimala is one of the most renowned temples located in the state of Kerala dedicated to Lord Ayyappa. The shrine is located in the depths of the Periyar Tiger Reserve, amidst 18 hills and protectively wrapped by the Western Ghats. The dense forests which surround the temple are known as Poongavanam or the garden of the lord. 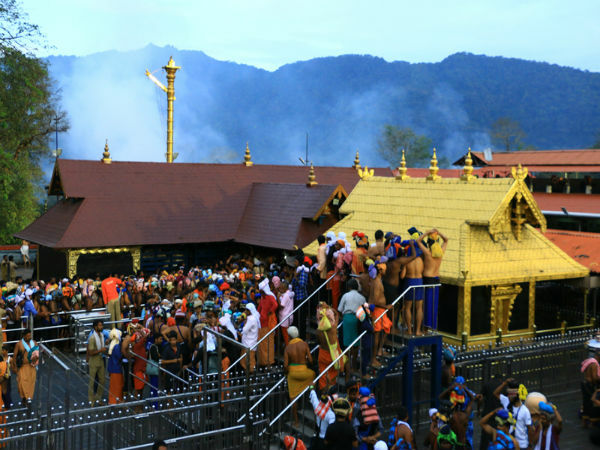 Sabarimala Temple, unlike other shrines, does not open its doors everyday for poojas, but only for a period 51 days annually and during the first five days of every Malayalam month. The temple witnesses millions of people who come to offer their prayers to the deity after following a strict 41-day fast, with a strict vegetarian diet, no alcohol or smoking or indulging in any sort of carnal pleasures. The annual pilgrimage to this hill shrine is considered as one of the largest annual pilgrimages across the globe. Although only men are allowed to undertake the pilgrimage, women from the age group of 10 to 50 are not welcomed into the shrine, as per traditions and customs followed since time immemorial. According to the temple history, the Sastha Temple at Sabarimala is one amongst the five Sastha temples built by Parashurama. The other temples in the group are located at Kulathupuzha, where the deity is worshipped as a child; Aryankavu, where he appears as Brahmachari; Achankovil, where he lead the leads the life of household man and is worshipped along with his two wives Purna and Pushkala; Sabarimala, where he is depicted in the Vanaprastha stage of life; the last one at Ponnambalamedu where he appears as a yogi. After the installation of the shrine, the place was unreachable for many centuries and it was in the 12th century, a king named Rajashekara Pandiyan rediscovered the path to Sabarimala. The king then renovated the temple and reinstalled the deity. The temple was rebuilt after a fire in the year 1950, which was suspected to be the activity of radical groups. The fire completely destroyed the entire temple and had to be rebuilt, the earlier stone idol of the deity was replaced with another one made of an alloy of five metals. The flag staff was installed in the year 1969 and was replaced with a new one in the month of May this year. Any devotee who wishes to have a darshan of Lord Ayyappa at Sabarimala must climb up a flight of 18 steps before reaching the main shrine. The 18 steps or Pathinettampadi are given equal importance as the deity and hence, is considered holy by the devotees. While ascending these steps, devotees are expected to carry irumudi on their heads. Irumudi is a small bag which comprises of various pooja materials that are taken as offerings to the deity. The Sabarimala Temple, opens its doors for devotees at 5.00 pm on 15th November 2017 for the annual Mandala-Makaravilakku Utsavam. The temple is administered by Travancore Devaswom Board which is managed by the Government of Kerala and is one of the most important temples in the list of many controlled by the board. Every year, the government authorities provide numerous facilities for the pilgrims to avail. One recent such facility is the Virtual Q; the program is an initiative launched by the Kerala police for the purpose of crowd management. Devotees can pre-book their time slots to reach the shrine without waiting in the long queues formed at the base camp in Pampa. Currently bookings are open and has been opened for the entire pilgrimage duration. Plastic is banned in Sabarimala; hence, devotees are requested not to carry any plastic covers, bottles, etc. Pampa river is considered as a holy river; hence, polluting the river is a punishable offense. Devotees are requested not to dump used clothes or use soaps or detergents in the river. Take care of the surroundings just as you would take care of your home and its surroundings. Smoking, consumption of alcohol or other drugs is strictly prohibited. Subject yourself to security checks at the various security checkpoints. By Air: The nearest major airport is the Cochin International Airport at Nedumbassery, which is located at a distance of 156 km from here. The airport is well connected to a number of major airports across the country and to a number of them abroad. By Train: The nearest railway stations to Sabarimala is Chengannur, which is located at a distance of 90 km. The station is well connected to most of the major towns and cities across the country. Once you alight at the station, you would come across a large number of buses which operate a chain service from the station to Pampa. By Road: Most of the pilgrims to Sabarimala come by road. The place has an excellent connectivity by roads, with regular buses operated by the Kerala State Road Transport Corporation, which connect to major towns and cities across the state and to a number of them outside the state as well.